Thankfully, sedation dentistry offers a way for patients to visit their dentist without worry. 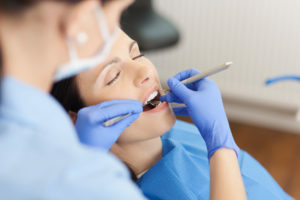 Below are two of the most common types of sedation dentistry. Oral sedation, typically administered in the form of a pill taken one hour before a dental procedure or checkup, is most commonly used for restorative dental services such as root canals but can also help relieve stress for patients who experience dental anxiety. Oral sedation produces a light to moderate level of sedation that leaves patients at ease during dental exams but still conscious and able to respond to prompts from the dentist. The effects of oral conscious sedation can linger for several hours after the procedure is complete, so patients should plan to have a friend or family member drive them home afterward. Inhalation sedation using nitrous oxide, also known as “laughing gas”, has been used for over 100 years and can help reduce dental anxiety in both adults and children. Despite the name, nitrous oxide does not actually cause uncontrollable giggle fits. Instead, patients feel a pleasant feeling of euphoria through their body that helps make all their stress and worries disappear. Administered through a mask that fits comfortably over the patient’s nose, the mild gas does not limit consciousness during dental procedures and wears off swiftly, allowing patients to leave the office feeling normal and alert. Don’t sacrifice your oral health just because the thought of visiting the dentist makes you nervous. Before skipping your next regular dental checkup, talk to a dentist in Yuba City about how sedation dentistry can make your dental anxiety vanish! Dr. Ajaipal Sekhon and the team at the family-owned Fit Dental strive to offer high-quality dentistry at affordable prices for their patients. They understand that some people feel anxious when visiting the dentist, which is why they offer both oral sedation and nitrous oxide to make any patient’s visit worry-free. If you want to learn more about Fit Dental, visit their website today or call the office at 530-822-9090.